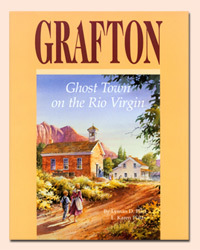 Since Grafton has the label of being a “ghost town” we get a lot people asking about ghosts. ViloDeMille told her Grafton ghost story to musician Phillip Bimstein. He and his band Red Rock Rondo composed a song about it Back and Forthfrom one world to the other. 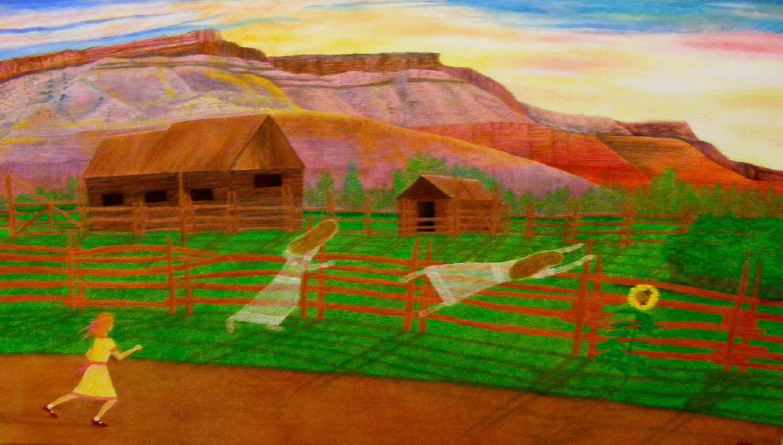 Katherine Bailey sent us a copy of her painting of the story. Vilo’sstory recalls a time when she was atwelve-year-old girlliving in Grafton in1927, before it became a ghost town.One evening she was playing “run sheepyrun,” which we would call “hide-and-seek” today.She was “it” and after she did the count-down and opened her eyes she saw two girls in long white dresses running toward a fence.Vilothought it strange that she had never met those girls.She gave chase and one girl went right through the fence and the other flew over it in a ghostly fashion.Vilofelt dumbfounded and ran home to tell her parents.They looked at each other and said, “Oh, that might have been the ghosts of the two girls who died in a swing accident of 1866.”Loretta (Lotty) Russell, age 14 and Elizabeth (Lizzie) Woodbury, age 13 were swinging on a rafter in an old mill that collapsed killing them.They were best friends and buried together in white dresses in the same grave in the Grafton cemetery. Their grave is in front of the wood enclosure. 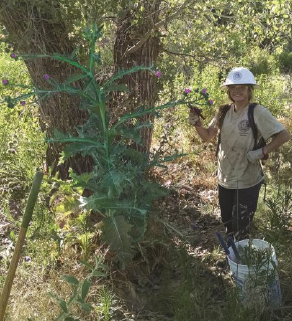 The American Conservation Experience (photo above) had 12 crew members come out and help remove scotch thistle seed heads and dig out entire plant on the Grafton property.In total the group treated 423 scotch thistle plants. One of our goals of the Grafton project is to restore the Virgin River floodplain forwildlife habitat. The Partnership has applied for and received funding to remove Russian Olive treesand tamarisk from the floodplain on 175 acres of land and replant with native willows along the river. This is huge job and very challenging since it is a very active floodplain. The river is channeled very narrowly though Springdale and Rockville and expands onto a large floodplain in front of schoolhouse. It is one the only areas on the river that has regeneration of cottonwood trees. The Natural Resources Conservation Service (NRCS) is leading the project. The Fish and WildlifeService Partners for Fish and Wildlife Program is involved as well as other partners. The Russian Olive trees were cut down and tamarisk removed. Some are growing back and will have to be cut again. Over $17,000 was spent on native plant seed. We have also removed large areas of noxious scotch thistle over the past couple of years. Cattle and wildlife don’t go near them because of their spiky leaves. Another exciting historic preservation project that is currently underway is the rehabilitation of the historic Rockville Bridge; gateway to Grafton. Listed on the National Register of Historic Places and the last of its kind in Utah, the bridge was built in 1924. The Town of Rockville is seeking matching funds for a federal highways grant they received to restore the bridge. 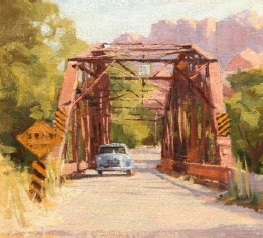 If you would like to learn more about this project or contribute go to: http://rockvilleutah.org/bridge? Everyone is invited to the annual Grafton Reunion, September 24, 2016 at Grafton from 12-2:00 P.M. Bring your lunch, hat, chair and memories to share. The Partnership will have a display of historic photos in the schoolhouse and items such as books, pictures of Grafton and t-shirts. There will be a program and if you have any stories you would like to tell about Grafton, or a song to sing, call us (phone 435-635-2133). A Grafton Reunion Facebook page has been set up. Where anyone can upload photos and histories at https://www.facebook.com/graftonutah It is also posted on our webpage.